There are only five remaining active Irish pipe bands with a military affiliation. One of the remaining bands is The Pipe Band of the SA Irish Regiment, unique among pipe bands in South Africa today. The SA Irish Pipes and Drums is a formidable competition band winning most of the competitions in which it participated in 2009 including the "Drill, Dress and Discipline". The band has been awarded the South African Champions and Champion of Champions trophies for 2009. 2010 the band is once again at The Edinburgh Military Tattoo, where as it represented the SA Irish Regiment and South Africa in fine style. 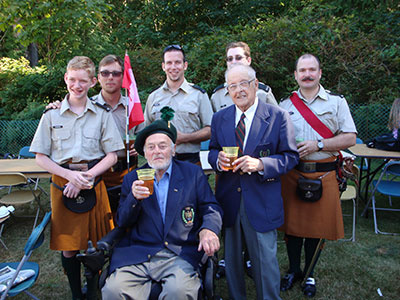 The Irish have have been very fortunate to have a warm relationship with SFU's world class pipe band. The famed Simon Fraser University Pipe Band won its sixth world championship in Scotland on Aug. 16. Members of both SFU's pipe and drum corps have very generously mentored our band. With this guidance our band has made great strides in musicianship. We greatly respect and appreciate this affiliation. Wearing the MacLean of Duart Weathered Tartan, the 43-member band is led by Pipe Major David Hilder, Drum Sergeant Andre Tessier, includes award-winning pipers and drummers from B.C. Senator Larry Campbell Has been a great friend and supporter to us over the years.